Thomas Jefferson and Alexander Hamilton had opposing ideas about how the new nation should be governed. Their dispute helped create the system of political parties in the United States. This week in our series, Maurice Joyce and Blake Lanum have more in our story of these two early American leaders. The Federalist Party, led by Treasury Secretary Alexander Hamilton, supported a strong national government with a powerful president and courts. Federalists thought men of money and position should rule the country. And they did in the early seventeen nineties. Federalists controlled the Congress. They also had great influence over the nation's first president, George Washington. 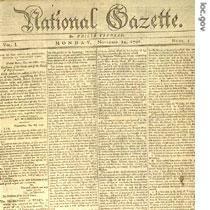 The Republicans, led by Secretary of State Thomas Jefferson, did not want a strong national government with unlimited powers. And they believed political power should be spread throughout the population. The power of the press grew over time. 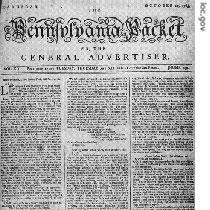 This Pennsylvania Packet newspaper in 1781 published letters by George Washington and Alexander Hamilton. The two sides carried on a war of words in their party newspapers. Historians believe Hamilton himself wrote much of what appeared in the Federalist paper. Jefferson, they believe, acted mostly as an adviser to the Republican paper. Both papers carried unsigned articles attacking the opposition. Both printed stories that were false. At times, the attacks were personal. Many people felt two cabinet secretaries should be above that kind of public fighting. Toward the end of president Washington's first administration, he received a letter from Jefferson. The Secretary of State said he planned to resign. He said he disagreed with most of the administration's national and foreign policies. He did not name Hamilton. It was not necessary. Washington knew what he meant. For Hamilton was the chief planner of those policies. The president tried to make peace between the two men. He liked them and respected them. He believed the new nation needed the skills of both men. However, the dispute had gone too far. It was now more than just a question of two strong men who could not agree. It was a battle of two completely different philosophies of government. Washington did not succeed in making peace between Jefferson and Hamilton. But Jefferson decided not to resign. In a letter to his daughter, Jefferson said: "the attacks on me have changed a decision which I did not think could possibly be changed. I must remain and fight." The idea of organized political parties was new in the United States. There were no laws saying what they could or could not do. There were no restrictions on the political activities of government officials. So, while continuing to serve as Secretary of State, Jefferson began working to get his supporters elected to Congress. He believed that was the only way to fight Hamilton. National elections were set for seventeen ninety-two. There was no dispute about the highest office. 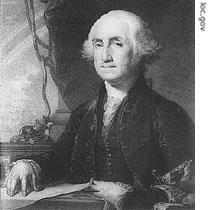 In seventeen ninety-two, everyone wanted George Washington to be elected president again. However, many Republicans saw no reason to re-elect John Adams as vice president. Adams was a patriot and had served his country well. But he was not democratic. He made no secret of his opinion that men born to the upper class should rule. Republicans had another reason to campaign against the Federalists. Hamilton's financial policies made it possible for bankers and other money lenders to invest in all kinds of deals. One man did this with information he got as a high-level Treasury Department official. His investments turned bad and his business failed. This caused other businesses to fail. There was a financial crash in New York City, the center of business in the United States. The Federalists were strong in the northeast. But the Republicans were gaining strength everywhere else. The election of Republican representatives to Congress in seventeen ninety-two would make them an important force in the House of Representatives. The Republicans did not, however, win the vice presidency. That office went once again to Federalist John Adams. Perhaps the one thing that saved Adams was the belief of many Americans that President Washington wanted him again as vice president. Yet Adams did not win a clear victory. The electors from four states voted for Republican George Clinton of New York. One state voted for Jefferson, though he was not a candidate. The year seventeen ninety-three saw a change in Alexander Hamilton's political powers. The Republicans in the House of Representatives demanded answers to questions about his financial programs. Why did the Treasury Secretary refuse to give Congress all the facts about government plans to borrow, to lend, and to tax? For four years, the House had passed all the laws Hamilton asked for without being told why the laws were needed. In his opinion, that was the only way to govern. Now, the House wanted to know more. Hamilton considered the request an insult. Yet he answered it. He produced four reports about Treasury Department activities. Republicans searched the reports for proof that Hamilton and his Federalist friends had been dishonest. They found no such proof. And they did not accuse him of taking money for himself. But they attacked him on several other issues. For example, they said Hamilton had not followed President Washington's instructions for dealing with the nation's foreign loans. They said he paid too much interest to the National Bank of the United States. And, they said he did not carefully obey laws passed by Congress concerning the use of government money. Federalist members of Congress answered the accusations. They declared again and again that the Republicans had not been able to prove even one criminal act by the Treasury Secretary. The attempt to force Hamilton out of office failed. But Hamilton himself was ready to leave. He was satisfied with the work he had done. More than any other man, he had shaped the policies of the United States for the first five years of its existence. He was sure the young nation would continue to be governed by the political ideas he supported. Hamilton went to New York City to work as a lawyer and spend more time with his family. Most Americans were not excited by the debate between Federalists and Republicans on such issues as the Bank of the United States. Farmers and laborers did not understand economics. But the French Revolution was something else. Federalists opposed the French Revolution. They denounced the violence and the murder of the king and queen. They also wanted closer economic and political ties with Britain. Republicans welcomed the revolution. They saw it as a fight for liberty and democracy -- the same ideas they fought for against Britain. Besides, they said, Britain was no friend of America. Britain still held land in the western United States in violation of the peace treaty between the two countries. Britain still paid Native American Indians to kill White settlers in frontier areas. And Britain still took sailors off American ships and forced them to serve in its Navy. The revolution in France put the United States in a difficult situation. The situation became worse when the kings of Europe sent their armies against the new French republic. The United States had a treaty with France. It had agreed to aid France if France were attacked. But President Washington firmly believed the United States should not become involved in the politics of Europe. So he declared the United States would remain neutral. The declaration was a victory for the Federalists. They still had a great deal of influence over President Washington. But what would they do after seventeen ninety-six? Washington's second term would come to an end that year. And he had announced he would not run again. At that time, the Constitution did not limit the number of presidential terms. Yet, George Washington felt two was enough. Who was the most likely candidate to succeed him? That will be our story next week. Our program was written by Christine Johnson. The narrators were Maurice Joyce and Blake Lanum. Join us again next week for THE MAKING OF A NATION, an American history series in VOA Special English. 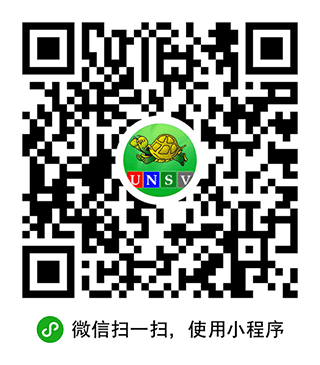 Transcripts, MP3s and podcasts are at www.unsv.com. In the early of American history the modern party system had form. Two men took a important act in party system. Thomas Jefferson and Alexander Hamilton had many disputes in how a government ruled the United States. Alexander hamilton thought elites ruled the nation but Thomas Jefferson thought the people should had the power in the nation. it is not untill finishing this section that i know the terms of " morden party system" in the United States. it came into formation extremely in the need of human nature. There were two sides. One for Alexander Hamilton who thought that men of money and position would rule the country . And second for Tomas Jefferson who insisted political power should be spread throughout the population. Disbutes happened so the modern party system was born. Both the two strong knew the power of the press, and how to win support by utilizing it. Fighting alone is impossible to win.